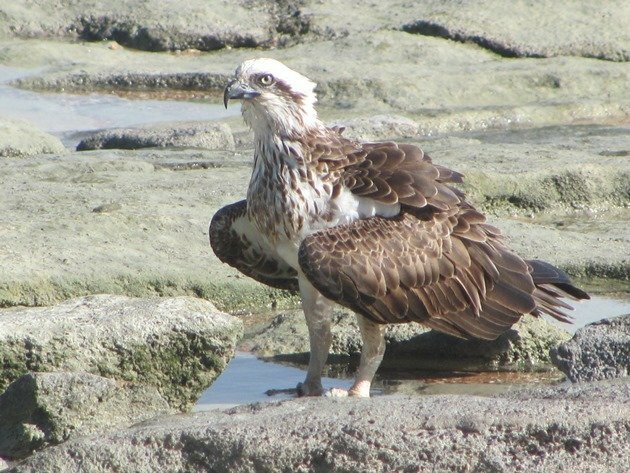 Ospreys are easily observed around Broome and their numbers have increased during the time that we have lived here. They nest in a variety of interesting places around town. Of course they are not at all interested in the platform that was erected for them at the reserve at Town Beach. They have other ideas! They had used it in the past, but nowadays they prefer to use the telecommunication tower on Barker Street, the telecommunication tower on Port Drive and the top of a tank at the fuel depot. 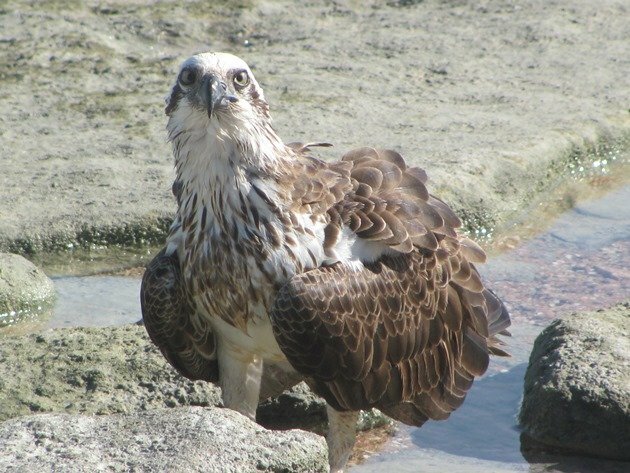 There is also a well-known nest site in the lighthouse tower at Gantheaume Point and all of these locations are ideal and not too far from the ocean. 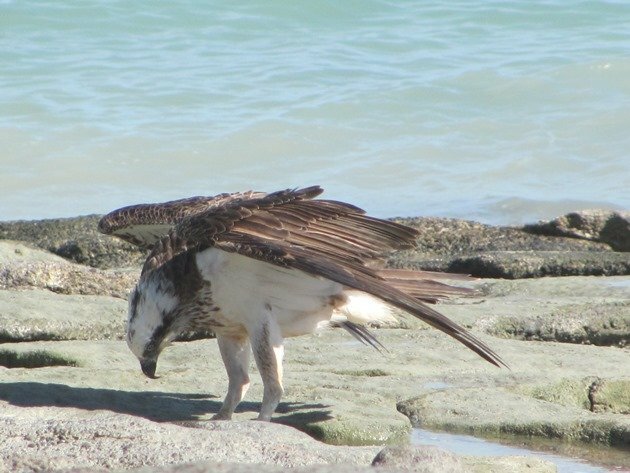 At any time you will find them in the Broome Port area and they have learnt that they have excellent fishing opportunities at night now. The lighting along the wharf attracts the fish at night and the Ospreys can swoop down and feed with great ease. 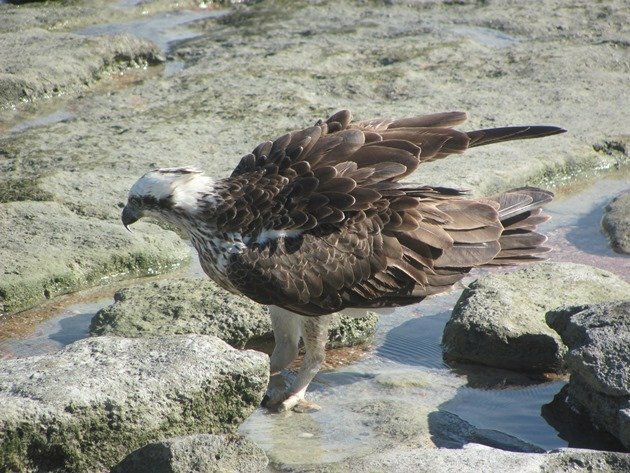 I often observe an Osprey or two on my walks along the beach and I often see them struggle with large fish, but this week there were fish schools leaping out of the water and the Osprey just could not be bothered. There was a good reason for this and the lack of anybody outside on this day was a good indication that it was HOT. 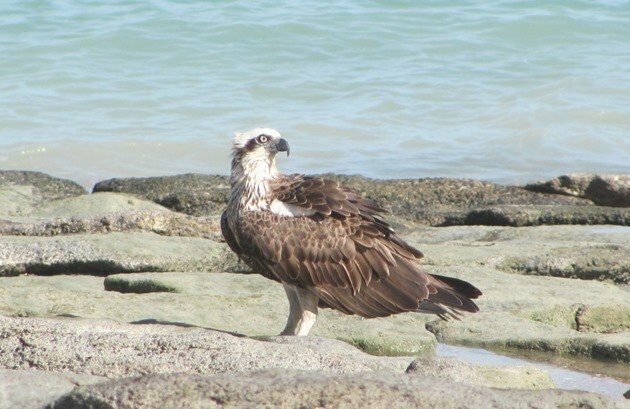 In fact I found out afterwards that it was 39c (102f) in the shade at the time that I was wandering along the beach and encountered the Osprey. 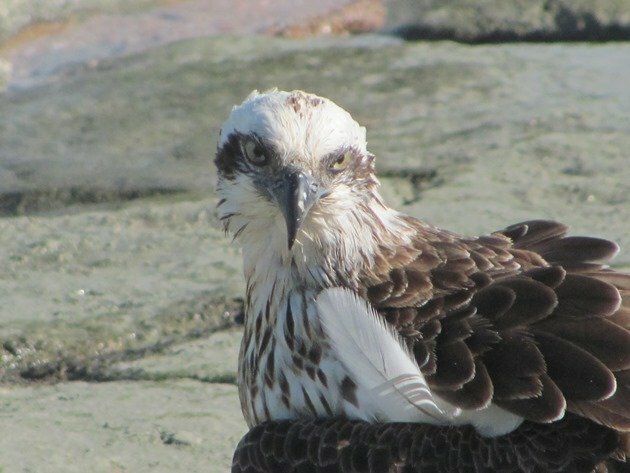 I had not expected the Osprey to remain where it was as I first approached, but I sat down and it did not move. 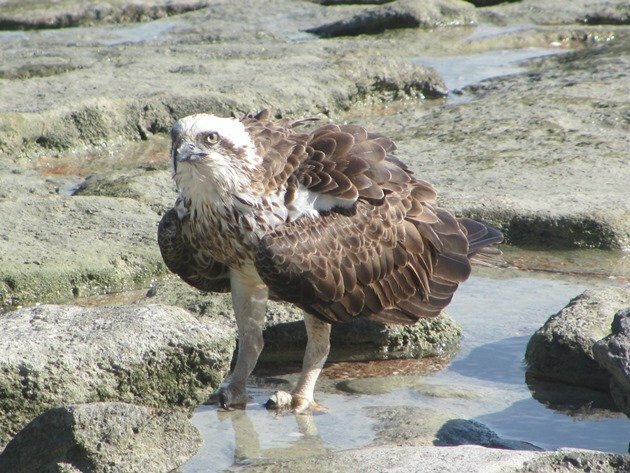 I then realised it had its talons in the pool of water left behind after a very big tide and had no intention of getting out of it if it did not have to. 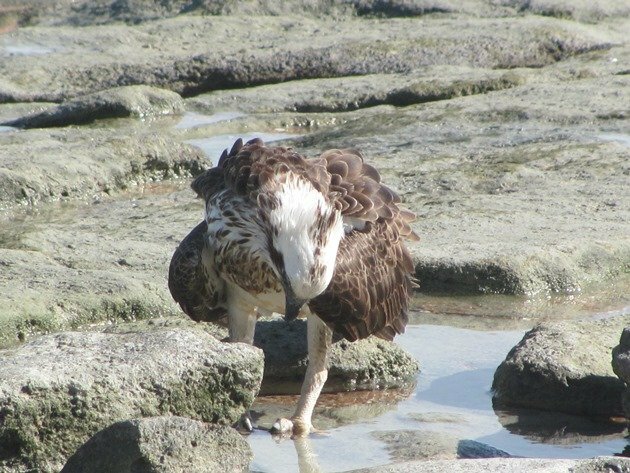 In fact it drank from the water and held its wings out slightly to try and catch a breeze. I was close to doing the same! At one point it looked down at the water as if it was wondering why it was so warm and not as cooling as it had hoped. It looked at me wondering why I did not have my feet in water too…..tempting!! It ruffled up its feathers on a few occasions and one became rather displaced and dislodged. 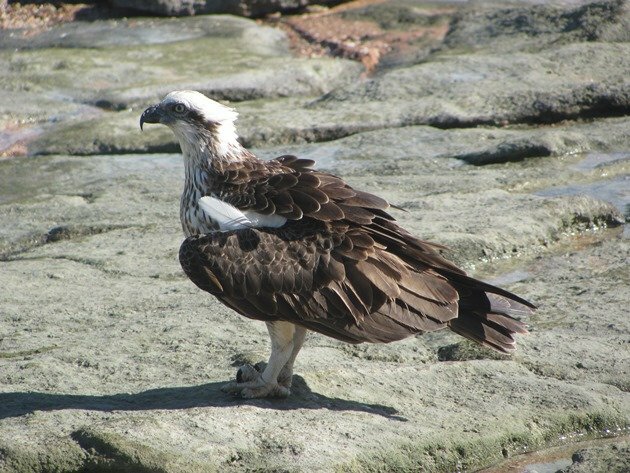 If you are around Broome then keep a look out for these magnificent birds and don’t get upset when they catch bigger fish than you can! 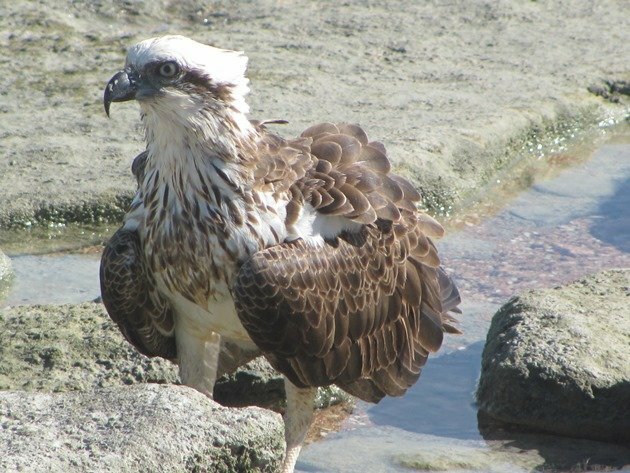 What a wonderful private moment with a magnificent osprey! Great photos, too!